Mike Ragogna: Mr. Idle, your latest, titled Total Rubbish, is not total rubbish, goodly sir. Eric Idle: [laughs] Well, it's "total" in regards of what we recorded. 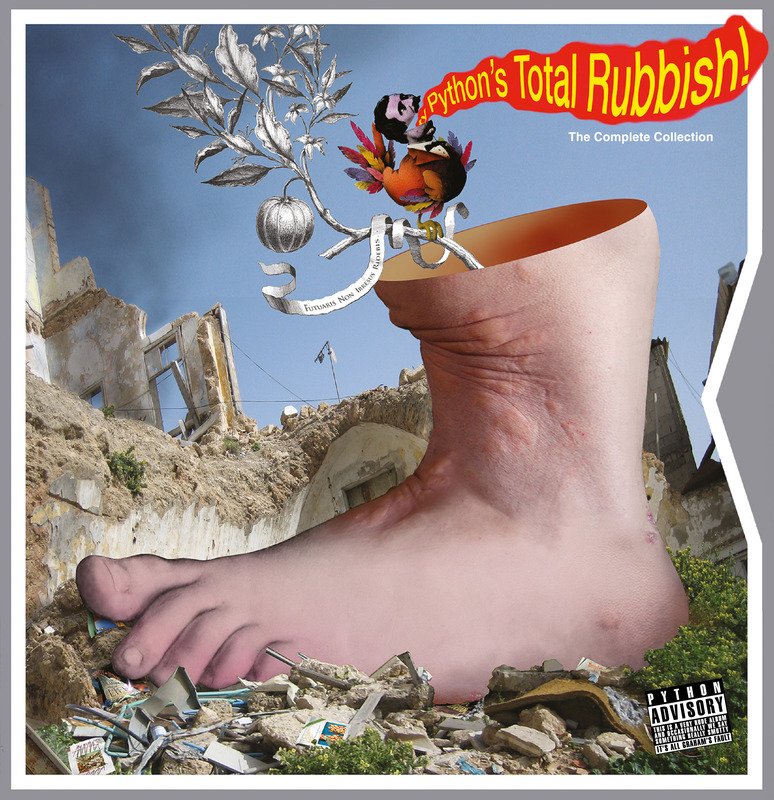 MR: A complete collection of basically everything Monty Python released on CD or records. Hallelujah. EI: Yes, it's the complete audio collection, and there's quite a lot of it, isn't there. MR: So whose idea was it to pour this much Monty Python into one container? EI: I think it was our wonderful manager, Jim Beach, who said it was time these came out again. There's such a lot of wealth of material we'd completely forgotten about because we wrote it only for the album. It's nice that they're out again. I actually haven't had time to listen to it, but I'm looking forward to it because I think there are some hidden treasures in there. MR: How do you feel the records compared to the TV show? Did they bring out some other elements of Monty Python that the show couldn't? EI: It started out just being a BBC record of the highlights of the first series or maybe the first two series. We did it in front of a live audience and it was material that was pretty much familiar to us anyway. All the other albums were created as records and that meant that people wrote fresh material, there's no visual element to it that's missing, it was for audio only. We used it to play gags like the three-sided album, which is, sadly, very hard to reproduce. MR: It was so confusing to try and land the needle on the right side! EI: We wanted to just blow people's minds when they put the second side on and it was completely different. We started both of the second sides with the same joke so they couldn't tell which side they were going to get. It was always fun playing around with the form and trying to startle and surprise the audience. MR: Monty Python was so influential globally, but you have to know that. EI: Python has been influential. Interestingly, when we first came to America in 1973, we were known purely through our records. Buddha Records put them out and people didn't know there was a TV series because it hadn't been on American TV then. It was like Firesign Theater, where it was just for audio. It was quite fun. EI: I think there's a truth in that. I think comedy is anger, and its expression in a very healthy form. MR: So there's a therapeutic element of it for you! EI: Comedy is very therapeutic, because it says things you don't really expect to hear. I think it's like The Emperor's New Clothes, with the kid going, "Look, he's not wearing anything!" I think that's what comedy does really well; it exposes hypocrisy and says, "You really shouldn't take these people that seriously. They're foolish, the lot of them." MR: One of the amazing things about Monty Python's Flying Circus was what you each brought to the mix to complete the picture. You all were stars in your own right and all of your talents were on full display, yet there was no single star. So how did the creative mechanics of this venture work? EI: John Cleese was a star because he'd done The Frost Report. He was very famous in England, but instead of doing a show like Ronnie Barker and Ronnie Corbett, he didn't want to do his own starring show. I think that's very interesting about him; he wanted to do a gang show. He and Graham [Chapman] were watching a show that Mike [Palin], Terry [Jones] and I did called Do Not Adjust Your Set and he said, "Let's get these guys." But when we came to writing material, it was always the whistle test. You had to read it out and if people laughed, it was in and if they didn't laugh, we'd sell it to The Two Ronnies. MR: Were there any routines where, once you acted them out, they were even funnier than how you conceptualized them? EI: The interesting thing about the group is it's a group of writers. I don't think there's ever been such a group before, where the writers have final say. We're always trying push it and not be the same old BBC comedy show, which is why we use that phrase, "And now for something completely different," which was used perfectly seriously on comedy shows and then they'd have somebody singing a song. There was always a component of light entertainment in British comedy TV shows. I think we were able to circumvent that and mock it, too. MR: Is there a particular album you admire most? EI: Everybody would take turns to do various things. 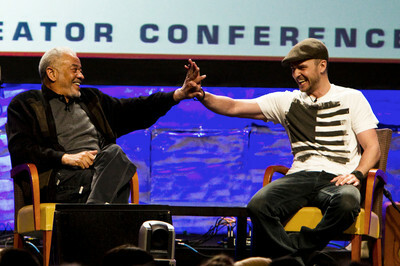 Often, the records were produced by Mike and Terry. I didn't get into producing records until Matching Tie & Handkerchief. John Du Prez and I were working on it and we encouraged people to put songs in it, which was a different move for Python. Then, finally, I got to edit all of the Python songs together on Monty Python Sings, which is our best-selling album by about a factor of ten because you can hear a song again, but you can't hear a sketch again. "I'm not going to put 'The Cheese Shop' on again, I've heard it once. I'm going to laugh, but I'm not going to laugh more the second time." But with a song, you can hear it again. 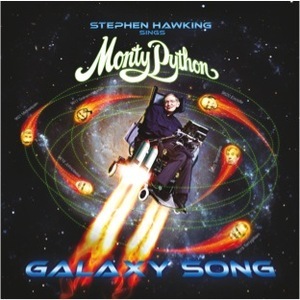 MR: Speaking of singing, you re-recorded "The Galaxy Song" only with Stephen Hawking this time around. How did that come together? EI: It came about because of '02 and the show we put on last year. Brian Cox is a friend of mine and he'd be going on and on about how some facts of "The Galaxy" are not accurate. That's mainly because it was written in 1982. Thirty years have gone by and we now have better understanding of how many billions of stars there are and what the distances actually are. He'd always go on a nitpick about that, so I wrote a bit for him where after we sang the song, he'd come on and start to pull it to bits. Then he gets run over by Stephen Hawking, and it made me laugh so much, the idea of Brian Cox being run over by Stephen Hawking that I said to Brian, "Do you think he'd do it?" He said, "I'll email him!" He got a reply in ten minutes saying, "Yes!" [laughs] So we had the brilliant pleasure of going up to Cambridge for a day and filming with him. Next week, they're going to show that documentary Monty Python Live where you actually see us going in. We had already got him saying the lyrics and we added music and tempo and adjusted things and we play it to him and you just see him smile. It's just really sweet. MR: That sounds like another amazing off-the-scale moment for you. Some of your songs especially are so well-known and loved that singing them--especially "The Lumberjack Song"--practically was a ritual for every kid growing up. What is your explanation for Monty Python's popular culture resonance? EI: I don't know. One thing we always agreed on was it would never go in America. We were convinced that that was so, but some American producers came and asked us if they could buy the format and we all had a good laugh and said we don't have a format. So I said, "Let's sell it to them anyway." We really thank PBS. PBS made it popular and it was on in every city in every part of America. It would still not be on network TV. It's largely thanks to PBS. Nobody measured the people watching PBS except in Dallas, where when they first put it on they got these enormous figures suddenly. Dallas was the first place to put it on. MR: Could one of the reasons Monty Python was so popular with kids be that teachers turned their students on to the show? I remember one of my high school english teachers took our class on a field trip to see Monty Python and the Holy Grail. EI: I think the playground is the first place where kids start to say, "Did you see that show last night?" and Python really was a classic cult show. It had a tiny audience, really. It was late on a Sunday night in England and people go, "What's this?" It's kind of amazing that it's in ninety-two countries now. It's mind boggling. The Russians watch it, the Japanese watch it, the Czechs watch it, the Hungarians watch it. It was saying something kind of silly about humanity, I think. I guess in a way, it was also about Television, which was certainly new in England. It reflects the television culture, which is not the only culture you there that is left. EI: It's a funny, sort of strange parody of bureaucracy and politics, really, the silly walks. The idea that you would have a whole department of silly walks, there are just as equally silly departments doing silly things. The Penguin is just completely, wonderfully absurd. Now it's time for your penguin on top of your television set to explode. MR: As far as comedy in films, Monty Python and the Holy Grail, ...Life Of Brian, and ...The Meaning Of Life really pushed boundaries. I always hoped there would be a next one. By the way, why wasn't there a next one? EI: We found that there aren't many great subjects left. When we wrote and filmed Meaning Of Life in 1982, that's sort of the last time we performed together until 'O2. It is a young person's game, that sort of sketch comedy. You begin to want to write longer pieces--well, we did write movies, but it's harder to write a movie with six people. It's just harder because you get the characters and a plot and all of those things that you need in long form are harder to do in a group whereas what we used to do was just dash out funny bits and stick them together and find themes that link them and exploit the random quality of it but appearing to make them connected. MR: Then again, you quickly went into a smaller format with Rutland Weekend Television that gave birth to The Rutles. EI: Yeah, but nobody had parodied The Beatles. They were gods. This was 1977, so they were all still alive, it hadn't become where everybody's lives were somewhat tragic in parts. It sort of just took the story, which is a great story, of these guys who come out of nowhere and just take the world. MR: Speaking of The Beatles, George Harrison practically became a member of your troupe. EI: He was such a huge fan of Python and all rock 'n' roll people sort of were, really. We were the ones who weren't playing instruments, but we're all of the same generation, that sixties generation, except our thing's comedy. We kept together a pretty good time. We started in '69 and ended in '82. That's a pretty good run for a bunch of guys who are going to get married and have their lives. I think we did pretty good holding together. MR: Eric, what advice do you have for new artists? EI: I think what you do is you start out copying people you love. We copied Beyond The Fringe and The Goons and then you get into the rhythms and you start to write your own versions. I think you have to learn somebody funny and understand what's funny and then try to find your own voice. MR: Do you feel like Monty Python completed its mission? 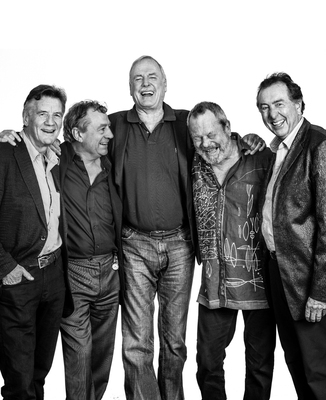 Are you satisfied with Monty Python's legacy? EI: I think we did good. I'm most proud of the fact that we actually got together in our seventies and actually went and did a farewell show. I think that's fairly unlikely. I think all of us would have said, "No, that's never going to happen," but then under the circumstances, there we were just doing it. It was kind of fun and sweet and tender and touching. It was a great evening. MR: I'll never forget watching the reunion, seeing the urn sitting there, thinking, "Oh my God, no!" EI: We did a great joke with the urn at one comedy festival where we kicked it over. That had four minute laughs on it. The audience just couldn't believe we had gone there. We were sweeping it up and getting vacuum cleaners and brushing it up. It was good fun. MR: So when's your next farewell tour? EI: I think it's quite impossible. A, Michael Palin doesn't want to do it and B, we just about got us in time. We're kind of old and it's a lot of hard work. I think we just found the best way to come together and do it for the last time. I think that's got a lot of class to it. I think you won't see all of Python going out again for sure. I think people won't stop performing and doing their own things at all, because that's what you do with your own life, but I think the unlikelihood of getting five people together--people always want you to write things, they don't realize we live in different continents and rarely meet. You have to be together to write something, even if we had something we could still do, those time are gone. I wish there were more Beatles songs. 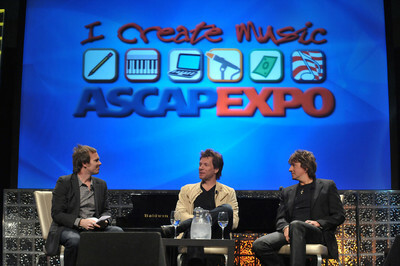 "It's the 10th Anniversary of The ASCAP "I Create Music" EXPO. Twenty-five hundred songwriter and music industry hopefuls at all levels of their respective careers, come out to Los Angeles each year to experience this three day ASCAP EXPO experience. Over 60% of the attendees travel from all over the country and internationally. "This is the only resource of it's kind, and all are welcome. 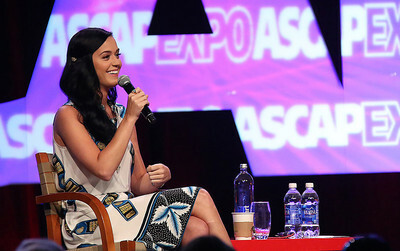 One does not have to be a member of ASCAP to participate. The Loews Hotel complex is buzzing with one-on-one opportunities, seminars, workshops, and live music simultaneously and all in one complex. Networking opportunities have garnered some amazing success stories [note: see below], and so much good information is imparted by top music industry professionals. "Over the years, music icons Tom Petty, Kary Perry, Jeff Lynne, Dr. Luke, Quincy Jones, Justin Timberlake, Ludacris, Jon Bon Jovi and Richie Sambora, and so many more have taken part in this both creative and informative, 3-day experience." Aloe Blacc ­​was already a performer/songwriter when he attended in 2010. He was inspired by hearing B​ill Withers speak. "He is one of my great heroes. He was reciting lyrics of songs that he's never released or even finished and it showed me that the creative spirit never ends. That's what I can take to the grave: Whether there's a career or not, you're an artist for the rest of your life. You may not be a commercial product for the rest of your life, but at least you have your art with you." "As a recap, 5X Grammy Award Winner Malik Yusef and Lawrence Berment (Mindkilla) met at the ASCAP Expo in 2012 during the iStandard Producer contest. Since that time, Lawrence has been in the studio with Malik and Kanye West as well as being referred to Sky Vision Consulting, featured on a Coast 2 Coast mixtape hosted by Malik Yusef, they are working on major placement deal courtesy of Malik Yusef's Universal Music Publishing deal for syncs and lastly these two to work on an exclusive Malik Yusef & Mindkilla mixtape project that is scheduled to drop in May of 2014." 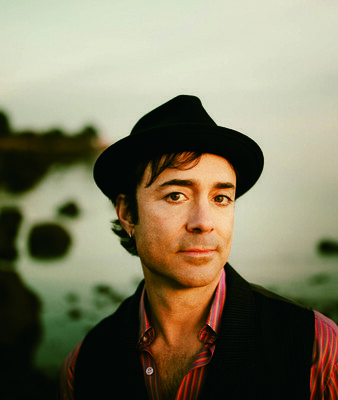 Gary Lynn Floyd​­ Played showcase at 2012 EXPO. Woman from Global Women's Empowerment Network heard the song and loved it. 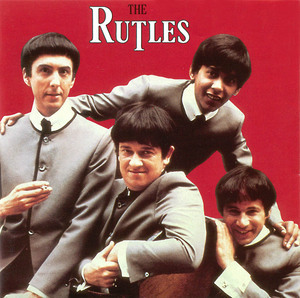 It became their theme song and later won the Hollywood Music In Media Award. Noam Weinstein​­ met Mike Viola in an elevator, which led to Viola producing his record. John Forte (Fugees)​­ met Natasha Bedingfield, which led to a later collaboration. "Rosaline is the title track off my new EP. The song is about losing a close friend due to romantic tensions. It's one of the few songs that I've fully written on the piano, and one of the first that felt like it needed to be on piano to fully capture what I was going for. My close friend Ben Klein shot and directed the video, and Mary Kerrigan did the sound. Anna Beckerman and Julia Foote are featured on background vocals. I am very excited about the way that it came out." 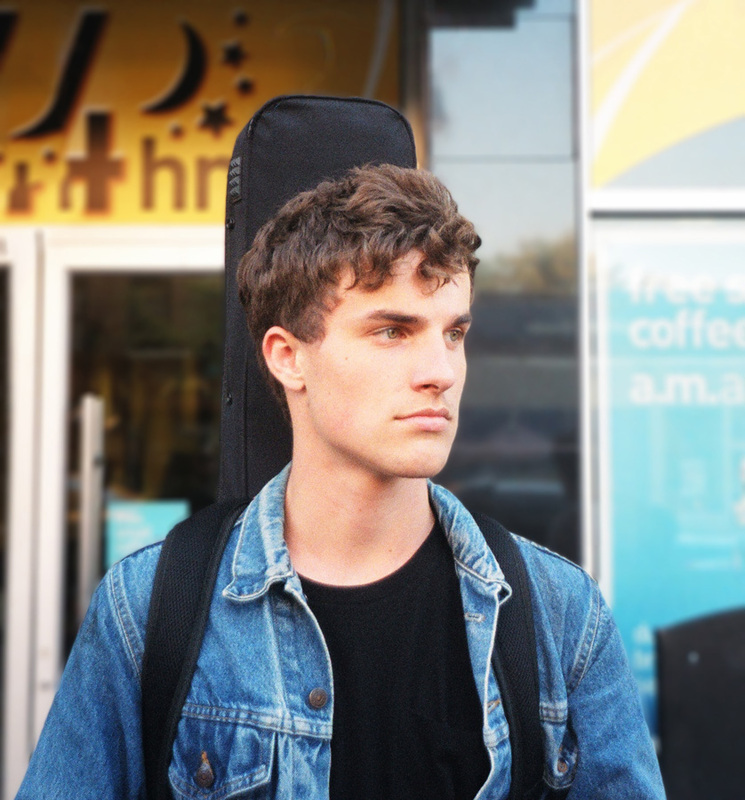 Scott will be performing at New York City's Rockwood Music Hall on May 1st. "'Hercules & Iron Man,' which draws parallels between the struggles of mythological heroes and the struggles all of us face every day, seems to strike a nerve lots of folks. Whether we're leaping tall buildings or pushing a stroller down the street, it can sometimes take all our strength just to make it through the day. We succeed and many times fail but we do what we need to do. "Hercules" has become a heavily requested song on Flickering. My buddy Jeff Campbell who sings on the record and who has performed it with me many times did me the favor of coming to my studio to capture it in an honest, stripped down, manner. Thanks Jeff!"